The Loop Matching Transformer product range consists of the LMT100, LMT200, and other variants. All units in this range are IP65 rated loop matching transformer units, which enable the ASL 100V Line amplifiers to drive low resistance Audio Frequency Induction Loops (AFILs). These induction loops are typically installed as a single turn conductive loop in passenger lifts, platform shelters, ticket offices, and other areas where it is required to provide a direct transmission of a Public Address or Voice Alarm broadcast to hearing aid wearers. The ILP01 Induction Loop Panel provides an easily mounted induction loop solution for areas requiring localised induction loop coverage. For installations such as railway stations this will be for Ticket Halls, and areas such as platforms, passageways, and concourses. This Induction Loop system helps service providers comply with the Disability Discrimination Act requirements for the hearing impaired, with the minimum of installation work, and of impact to the aesthetics of the site.The ILP01 Induction Loop Panel is fully compatible and integrated with the Application Solutions range of Public Address and Voice Alarm systems, typically using 1, 2 or 3 loops driven from a M100 100 W amplifier. The location of the amplifier in the PA (Public Address) racks provides increased reliability and reduced maintenance cost compared with local amplifier solutions, and also enables the provision of standby amplification and battery backup.In London Underground (LUL) applications the ILP01 Induction Loop is suitable for installation either on the wall or on the ceiling above the journey planner board. When wall-mounted it is suitable for installation at 2.5 metres nominal height whereas when ceiling-mounted it is suitable for installation at 3.5 metres nominal height.Ticket Hall installation normally requires two panels and an optional infill panel, while a single panel can be installed where a smaller coverage area is adequate, e.g. in passageways or concourses. Up to three panels can be driven from the same feeder line in different areas of the same PA zone without loss of performance. 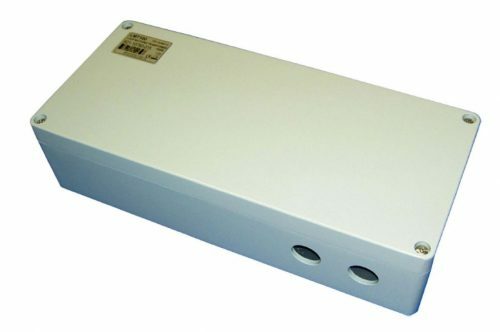 Each panel can be connected to the 100 V feeder line of an ASL PA system in the same fashion as a loudspeaker, and an end-of-line (EOL) resistor is fitted on a terminal block in each loop panel to terminate the line.The ILP01 is fully compliant with AFILS (Audio Frequency Induction Loop System) standard BS EN60118-4, and LUL Induction Loop specifications. When installed as outlined on the following page the coverage area exceeds 6 sqm in Ticket Halls, and is in excess of 2 sqm for journey planners in platforms, concourses, and passageways.